Here is some information to help orient you to your first Repair Café. For a sense of the scope of volunteer roles, check out the Volunteer Descriptions Pamphlet. In addition, it’s important that you’re familiar with our House Rules and Safety Procedures. Events generally last for four hours and change location every month. You might want to visit a Repair Café the first time simply to observe, without feeling obliged to get to work. We ask volunteers to try to arrive a half hour early – extra hands are helpful in setting up and Fixers like time to set up their work space. First timers receive a name tag at the reception desk. As a volunteer fixer, you will be paired up with a visitor seeking help in your area of expertise. Bring any tools you like to work with. Many fixers share tools and Repair Café Toronto provides some gear (e.g. . general supplies such as tapes, glues, light bulbs and some sewing notions are available). You are here to enjoy yourself and may decline an assignment for any reason. There is a variety of roles for general event volunteers, such as greeting new arrivals or helping with the visitor exit survey. It is equally as important that you enjoy the event as much as help out, so please do what you feel comfortable with. An apprentice fixer can work together with a more experienced fixer, or move around to observe a variety of repairs. You will receive two emails before each event from our volunteer coordinator. The first will ask if you plan to attend. This information helps us to set up the event site. There is no obligation to come to every event so feel free to come as it suits you. The second email will give more information about the upcoming event and reminders about what the volunteers need to know, details such as travel directions, parking, tools and supplies, refreshments and lunch. A key goal of the Repair Café is to help people learn how to repair things. When a visitor comes to your table, check to see if s/he prefers to work on the item themselves with your guidance, jointly, or observe while you do the repair for them. If you are doing the fix on their behalf, be sure to explain the diagnosis and repair steps. Try to encourage your visitor to sit with you throughout the repair process. Of course you should feel free to collaborate with other fixers. 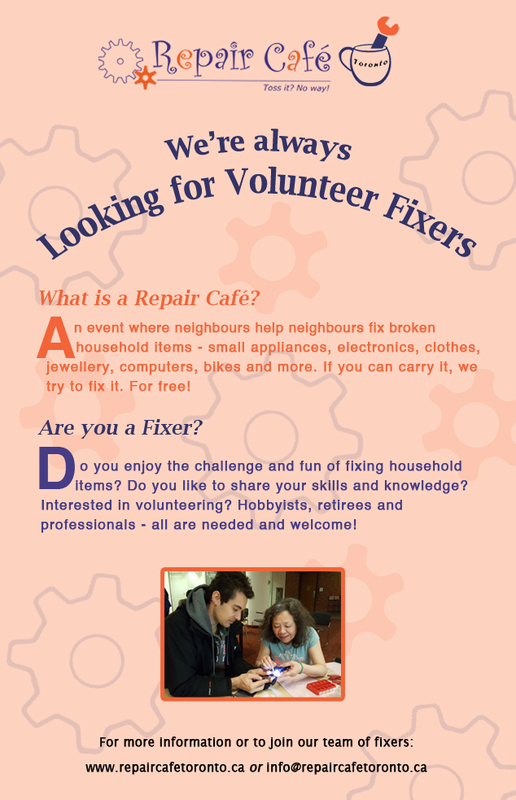 As part of Repair Café’s House Rules, neither Repair Café Toronto nor the Fixer is responsible for providing new replacement parts. If we don’t have the parts, you can suggest to the visitor what to look for (and possibly return with to complete the repair). Feel free to bring an item of your own for repair. You will need to register this item in the queue. There are often volunteers (sometimes media representatives) taking photos and videos at Repair Cafés, creating material for promotion and a record of events. If you don’t want to be included in camera shots, just inform the volunteer coordinator or photographers.